An underwater "animal forest" made from gorgonian soft corals off the island of St. John. The photo was taken by Peter Edmunds in 2013. Hurricanes Irma and Maria cut a devastating swath of destruction across the Caribbean this fall. They upended vegetation, destroyed structures and left thousands of people homeless and without power for weeks. The extent of the devastation on the region’s fragile coral reefs is unknown. Peter Edmunds, left, and Howard Laker at St. John in 2013. Photo courtesy of Peter Edmunds. California State University, Northridge marine biologist Peter Edmunds is co-leading a research team that is spending the next two weeks aboard a research vessel docked in the waters of the Virgin Islands National Park, part of the U.S. National Park Service, studying the impact Irma and Maria had on the coral reefs near the Caribbean island of St. John. Edmunds has an idea about what he might find once he gets to St. John. “I was there for Hurricane Hugo in 1989 and saw the devastating outcomes that come with the big waves and sand scouring that accompany hurricanes,” he said. “But the reefs that are there now are so very different from the reefs of 1989. 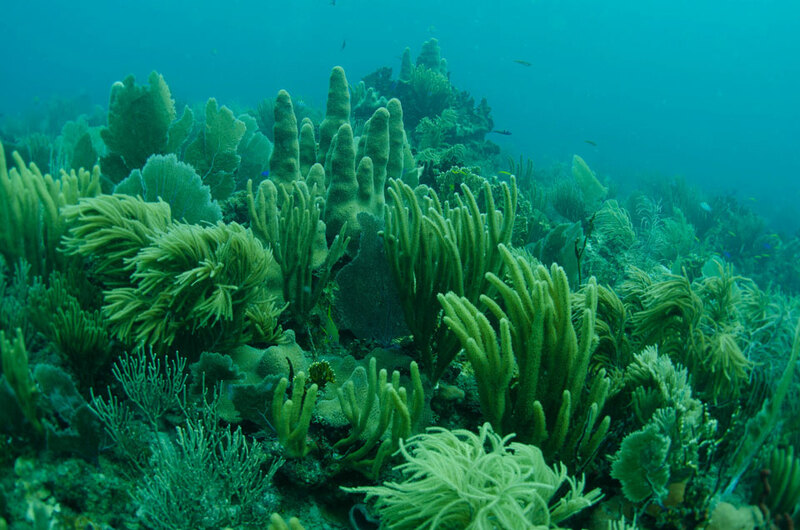 Today, there is a lot less coral and the relative abundance of each species is different. The changes that have occurred are region-wide, so it’s not just St. John, but how St. John interacts with the other islands around it. “What will be interesting to see is whether the resiliency of the reefs has degraded over the past 30 years or so,” he added. Edmunds and University of Buffalo geologist Howard Lasker together are receiving $199,000 through the RAPID grant program of the National Science Foundation (NSF) to study just how the back-to-back Category 5 hurricanes impacted St. John’s coral reefs. The research team includes CSUN marine biology graduate students Ashley Potter and Sigfrido Zimmerman. The hurricanes devastated the islands, including wiping out the land-based research facility that has hosted Edmunds and Lasker for many years. The NSF also is paying for the use of a research vessel from the University of Miami Rosenstiel School of Marine and Atmospheric Science. Edmunds said he is curious to see if the hurricanes’ impact above land will be mirrored underwater. “There is no doubt that there has been severe damage to the land, trees and all kinds of vegetation have been uprooted, and many, many people’s homes were destroyed,” he said. “But the destruction occurred in patches, and the notion that everything is gone is incorrect. 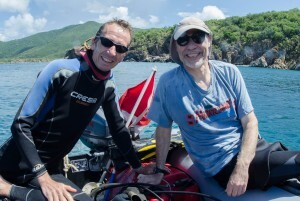 Edmunds has been studying the coral reefs near St. John for 31 years. He said he will be closely looking at which coral survived, which coral were killed by the hurricanes and which were negatively impacted by the hurricanes but whose deaths may have been precipitated by pre-existing problems. Edmunds already had plans to return to St. John in the summer of 2018 as part of his long-term study of the coral reefs in the region. His visit next week provides a valuable opportunity to gather timely information about the storms’ impact on the coral reefs — information that would not be available if he had to wait until summer. “Nothing brings more sharply into focus than an acute disturbance to underscore why we study these things for decades, so we can place these disturbances in context,” he said. “It emphasizes why you do the same thing year in and year out, and do it the same way. Only then can you truly evaluate what that disturbance has done, and objectively evaluate what will happen when you go forward. Edmunds said his trip next week will add to the knowledge he has gained over the past three decades about the health of coral reefs, like those at St. John, and help inform his research as he moves forward.